Industrial lasers are proliferating daily. More and more applications are moving to laser processing due to reduced costs of ownership, increased ease of use, and process flexibility. Manufacturers in many case must use a laser due to specifications, regulations, and industry standards - not to mention competitive pressures. Here are TJS we know where an industrial laser comes from and how to make an industrial laser perform at peak levels. 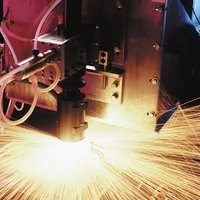 TJS services industrial lasers from all major OEM's. Laser marking, laser cutting, laser welding systems are TJS specialties. Our expert laser repair technicians have years of training and experience working on your lasers. In many cases our engineers have been factory trained by the OEM. Contact us today for a quote for laser components, laser on-site service, or laser repair. If you need a partner to work side-by-side with you to maintain your industrial laser so you can focus on the things that really matter to you - contact TJS today.